Patrick and Erich Asperschlager keep getting older, but this movie stays the same age. The Cannon film you were thinking of is "Going Bananas with Dom Deluise. Of course it is. Of course. It. Is. The first time I heard about this movie was when I saw a preview for it before Rookie of the Year at the Barrington Square theater. Talk about a room of confused 11 year olds. Good episode guys. To Erich's question about younger viewers, I've never really gotten the appeal of this movie. I'll be 23 in a few days, but I grew up listening to a lot of classic rock, so I'm not put-off by the music, but I've never really been able to suspend my disbelief that people acted like the characters in Dazed do. I don't really identify with anyone in the film. I think it's a 3 factor (or 3 bear?) explanation for me- (1) the Baltimore area is a lot more urban than Austin even now, but especially in the 70s, so the whole cruising around knocking down mailboxes aesthetic seems weird to me (2) by the time I was a teenager we had a computer in the house which granted virtually endless free entertainment, so (for better or worse) I'm not sure I've ever reached the level of boredom that would lead to these behaviors and (3) I was in a magnet program so I went to high school 25 minutes from my house and was thus not spending a lot of time with other teenagers outside of school (e.g. I didn't have a drink until college). Dazed has always seemed like an episode of That 70's Show with the jokes taken out to me, which is a bummer since I really like Linklater. I'd also be interested to see how other "millennials" feel about this movie! That's very interesting. I may not have articulated it in the show, but I wondered if the shift to online in the late '90s would make this movie less relatable to modern teens. It sounds like the answer is yes. What the kids do and say in the movie feels real to me, even if I wasn't in the high school party crowd, but it makes sense that it would seem more foreign as the years go by. I'm 19 and it wasn't until my third or fourth viewing a couple of months ago that it really came together for me. I had always liked it but comparisons to American Graffiti felt like a stretch to me. It may have been because this was my first viewing in college and was missing my friends, but with this most recent viewing I really connected to it. Like you, Joe, I have no experience knocking down mailboxes, never been in a pool hall, bought beer underage. What I responded to was, and what I think makes Dazed universal (to American high schoolers) is being with your friends and having a good time. Linklater nails the spirit of the first day of summer, the feeling of not having any responsibilities, September not even registering on your radar. Plus, it does make a great bookend to the more bittersweet American Graffiti. I was just out of high school when this came out and it was pretty much my experiences to a T aside from the slang and fashion (we listened to a lot of classic rock in small town central California). I'd imagine it'd be a lot different for people BORN in the late 80's/early 90's. I agree with Erich (I think it was Erich - or maybe I agree with Patrick) when he said they should have marketed Dazed to people in the 30s. Because watching it recently it felt like a memory, even though it was one I didn't quite experience. Like everyone else I was left cold by it when I watch it as a teenager (and I was doing my best trying to be a stoner teen). For me the appeal of this movie has always been that I enjoy spending time with these characters in a largely consequence-free environment. Thanks for the podcast, guys. It was revelatory for me because I always think, when watching almost any movie about high school, that I had an abnormal experience because I could never relate to the categorizing and stereotyping of kids and groups of kids. I thought it was ME because I'm not from the continental US. But oh, thank God, high school in those places is not as totally lame as those movies suggest. Why do other directors get it so wrong? Doesn't falsely stereotyping and pitting kids against each other when it's not even realistic seem kind of...wrong? 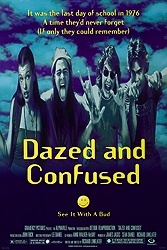 I assumed Dazed and Confused was the same way AND just another stoner film, so I never saw it. Now I'd like to. Your commentary on the movie reminded me of the reasons I loved the show Freaks and Geeks. Miss that show. I wouldn't say that other director's get it wrong necessarily. Obviously peoples' high school experiences can differ pretty drastically depending on each school's location, size, budget, or a number of other factors. The fact that there are movies like the Breakfast Club that seem to resonate with so many people suggests that there are at least aspects in it that ring true to them. Even in Dazed and Confused, you still have the Football players, the stoners, and the somewhat nerdy kids. There's no conflict between the groups, but it's largely through Randy that they interact with each other. It's Randy that invites Adam Goldberg and the others to the party if I remember right, he's the one who invites the Freshman Mitch along, and as the Coach mentions, he's the one who has started hanging with a "bad crowd", presumably guys like Slater and Pickford. Mm, yea, true. Experiences vary and Breakfast Club was really popular. I like the "people are not as they appear" moral of BC, but find it unbearably over simplified. Long time listener, first time reviewer. F this Movie! Is fantastic. Much like the old the racist lady in Always Sunny in Philadelphia in the third season who collects recipes but doesn't cook (https://www.youtube.com/watch?v=LeGjnwToqnI), I love listening to movie podcasts but never watch any new movies. However, this may change, because Patrick Bromley and his motely crew’s enthusiasm for cinema is inspiring. Really, listening to them during my commute feels like hanging out with my own misanthropic friends. Thank you. Now that bad news. I too was bummed by the audio quality of episode 400, as well as a few other episodes. I assume that F this Movie is so focused on the content and performance that they can’t be bother with the boring nerdy details of audio engineering. To that end, I’d like to offer my service as an audio consultant. No pressure. Also, I’d like to go on record as saying, Patrick’s dismissal of songs “Slow Ride”, “Sweet Emotion”, “Schools Out”, “Highway Star”, etc. from the Dazed & Confused soundtrack, while at the same time elevating Rock and Roll’s most over rated band (KISS) to be completely indefensible and almost entirely discrediting to the entire blog. I am not a big fan of those songs either (maybe Highway Star), I am willing to hear Patrick out, but I just want him to know he is on notice. Ps. For the record, Adam Riske’s autobiography would be called “Riske Business”. PPs. KISS is truly awful most of the time, but a few of there songs are perfect and accidental genius. Example: Detroit Rock City.